I'm always trying to find a good chore system that works. In other words, something that motivates the girls to do what they're supposed to do with minimal nagging from me. We've gone through sticker chart after sticker chart, we've tried chore buckets and clipboards (I do actually still use the clipboards for Saturday jobs, but they don't work for the after school stuff, I've found), we've done a whiteboard where I just wrote up a new chore every day, and who knows how many other things. One thing we've never actually done is attach allowance to the chores. I finally decided that maybe money was going to be the only motivating factor for my children, and I think we've finally found a system that we will stick to because so far it's working beautifully. Better than anything else we've ever tried--I just wish I'd actually thought of it myself! Here's how the system works at our house. 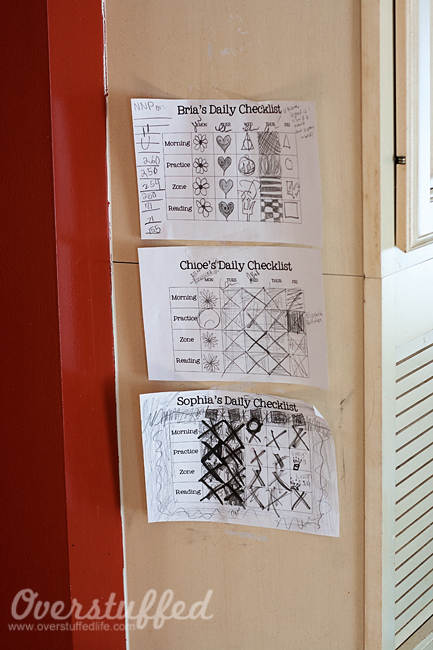 Each girl has a little chart that I tape up in the kitchen each week. It has spaces for morning, practice, zone, and reading. Yes, my children are quite creative when it comes to marking off their chores. Reading=They each have to do at least 20 minutes of reading each day after school. I also have started grouping homework in this slot as well. Mostly for Sophia who is going through a difficult homework phase right now. She's actually going through a just plain difficult phase right now--perhaps the winter is getting to her like it is to me. Each day, they are to do their list and mark it off. Once it is all finished, they must have a parent sign them off. I'm the mean one who usually makes them do a few more things in their zones before I'll declare it good enough, but The Maestro usually signs them off if it looks like they tried. Guess who gets asked to sign off more often? If they are able to mark off all 20 boxes in the week, they will get their full allowance. If they miss one mark, they get half. If they miss more than that, they don't get anything. Shawni has given her children the opportunity to earn back one mark per week by memorizing a scripture or poem she assigns to them. I decided to try this out as well, and that's been nice. I haven't actually had to employ it much, but when I do it's really cool to see my children working on memorizing a verse of scripture to earn back a mark. I try very hard to not remind them and let them be self-reliant. I figure if they really want their allowance, they'll do it. And as you can see by the marked up checklists, this is true. I will admit that some afternoons when I am especially frazzled I remind them multiple times, but like I said, I'm trying not to do that. Sophia is my only child that has found the obvious loophole in this system: once you miss three marks you may as well not do anything else for the rest of the week. She's a smart cookie, that one. I did find a way around that one, though. Absolutely no screen time if you haven't marked all four boxes that day. To her that is (unfortunately) more motivating than money. The allowance is just a nice little bonus. Turns out I'm smarter than she is, after all! We've been doing it this way for about three months now and the girls are still consistently motivated to do their chores/practice/reading. There are a few kinks to iron out--mostly in the process of signing them off and making sure that they are doing the chores well and not just stuffing things into random drawers, for instance. (I actually found some dirty socks and a few other strange odds and ends stuffed into the drawer where I keep tablecloths in the dining room.) But mostly it's been working like a dream, and I am eating my words about not believing in allowance. Not only has allowance been nice to motivate them to work, it has helped to teach them about tithing and savings, and it's been really wonderful to be able to tell them they are welcome to buy things with their own money when they ask for something at the store. This is a really good idea - something I might start implementing over the summer with my oldest... She is almost at the right age to start taking part in more chores. I'm going to pin it so I can remember it for later!